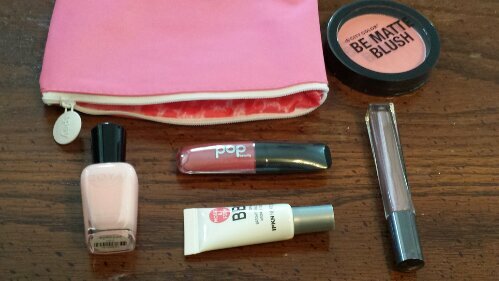 My February Ipsy Glambag has arrived, yay! I almost always love Ipsy and get super excited to see which items I’ll be receiving each month as they often have 12 different options, to which you get 5 full-size or deluxe-sample products. The theme this month is The Look of Love and as you’ll soon be seeing, most of the items stuck with a Valentine’s Day theme of red and pink.. including the bag! And they remind you to share via social media for your chance to win great prizes! So, first up, we have a full-size Zoya Nail Polish in Dot! This is a pretty pale pink shade, perfect for the departure of Winter and welcoming of Spring. I’ve actually used many Zoya polishes (some from Ipsy Bags, others from purchases) and I have to admit, their quality is equivalent to that of Essie or OPI. Next we have City Color Be Matte Blush in Fresh Melon! While I didn’t get the super hot-pink shade many girls got in their bags, this is still a pretty bold pink hue (I think the camera and lighting muted it down a bit). However, it works perfectly with my skin and hair color, and I dab the brush into it and then tap/blow off a little color, and just brush it onto the apples of my cheeks. Definitely recommend this brand and even the color! I have a weird love for BB Cream, and I’m not sure how I survived so many years without it! It’s like this awesome combo of lotion, primer, foundation and concealer all rolled into one! This deluxe-sample of IPKN Moist & Firm BB SPF 45 is really smooth and covers my skin easily. It’s just a smidge darker than I would usually go, but if I blend enough and give a light dusting of foundation powder, then I’m all set! I hadn’t heard about the brand before, but now after testing it out and reading more about it, I would love to get more products from IPKN. I think this item really took the cake. This POP Beauty Plump Pout in Peony Petal (phew, that was a lot of P’s!) is phenominal! I like it because it’s not some sticky lip gloss, or a dry lipstick, but rather a combination of high-shine gloss with the long wear of a lip stain. It goes on smooth and stays on looking fresh! Plus, it’s very similar to my NYX Matte Lip Cream (in both texture, look and color) and I was starting to run low on it, so perfect timing. Finally, we have this Tini Beauty Eyetini Cordial Cream Shadow + Base In One in Ambrosia. It’s a medium mauve- brown shimmering eye shadow that is creamy and goes on smoothly. Personally, I would never go out a buy this (just have a ton of eyeshadow and prefer pressed or loose powder) but I can figure out a way to make this work. I’ve received Tini Nail Polishes in the past, but never knew they made other cosmetics! I look exceptionally pale in this picture (really, I have a little more color!) but here’s a swatch of the cream eye shadow so you can see how the texture is great but it’s a tad bit dark for me. The bag itself was a cute pink, with white accents and a heart print on the inside! All in all, I LOVED my February Ipsy Glambag. At first, I was disappointed that I didn’t get the First Aid Beauty Deep Cleanser with Red Clay or the Pacifica Body Butter, but ended up being very content and happy with my items… it seems like they really took the time to go through my likes and dislikes and match up colors that would work for me. What do you think about the February Ipsy Glambag? Sign up for your own here!